Burnley moved a step closer to the semi-finals of the Inter Cities Fairs Cup in 1966/67 when they travelled to Frankfurt in West Germany and came home with a very creditable 1-1 draw from the first leg. 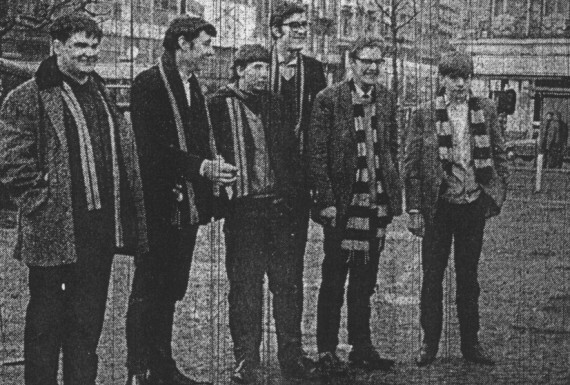 As the Burnley team prepared to leave the town for the vital Fairs Cup game against Eintracht Frankfurt there were problems afoot with members of five trade unions set to protest when Foreign Secretary George Brown visited the town. Their argument was with the previous Conservative Government but they were demanding that Brown, and Labour, put right the problems that were damaging the local textile industry. Entertainment wise things were looking up in the town and the Majestic, the Tivoli and the Imperial, three of the local cinemas, were now pulling in the crowds hosting big prize bingo. There were twelve games per evening for the cost of 2/- (10p) and players could go home with prizes as much as £15. If bingo wasn’t your cup of tea there was always the more traditional entertainment and for live entertainment Kenny Ball and his Jazzmen were appearing at the Cabaret Club in Rosegrove whilst at the Casino Club in Manchester Road you could hear the Four Pennies belting out Juliet. The journey to West Germany for the team was certainly not a smooth one. Club captain Alex Elder was left out of the travelling party. Manager Harry Potts said he wasn’t quite fit, but rumours circulating of problems between the player and coach Jimmy Adamson were hardly dampened when Chairman Bob Lord said the player would not be granted a transfer even if he requested one. Still, all was well on landing and they were met by the Eintracht secretary Herr Wilhelm Eward who welcomed them with a bunch of red and white carnations. Lord wasn’t on the flight, he arrived later with secretary Albert Maddox after attending a Football League meeting in London. Going into the game, the players were confident and coach Adamson claimed: “We will reach the semi-final,” although he did admit that the first thirty minutes in the Waldstadion would be vital. The only new injury worry for Burnley was winger Willie Morgan who had an ankle problem, although both forwards Andy Lochhead and Willie Irvine were ruled out, Irvine having broken his leg in the FA Cup replay at Everton. The game proved to be one of two halves, with our hosts in the ascendancy during the first forty-five minutes before Burnley came back at them after the half time interval. We held out for most of the first half but with just nine minutes to go to the break Eintracht took the lead when right-half Jürgen FRIEDRICH scored with a brilliant overhead scissor kick. This led to a torrid last few minutes of the half for the Clarets and with the referee looking at his watch the home side almost got a second. As in Italy, Harry Thomson saved the day with a superb save to deny West German international Jürgen Grabowski. The second half was a different story altogether, and by the end of the game the West Germans were thankful Burnley hadn’t turned it round and won the game. Morgan, having passed a late fitness test, was the main tormenter. Brian O’Neil had headed just over from a Ralph Coates cross and Arthur Bellamy went close but won a corner and it was from this flag kick that we grabbed our equaliser. Morgan’s cross was perfect for Miller to soar above a defender to head home between two players on the line. It was all Burnley now and in the last fifteen minutes we did everything but score. However it was their turn to hold out, and they did, meaning the two sides would meet again at Turf Moor with the scores level. We were already being made joint favourites with Leeds to win the Fairs Cup but first we had to get home and it was another difficult journey. This time the pilot claimed the winds meant landing at Manchester was beyond reasonable safety limits but they finally touched down safely in Liverpool. Tickets were on sale for the second leg, at prices higher than for league games. Prices were as follows: Stand ‘A’ 15/- (75p) Wing Stands 12/6 (62.5p) Enclosure 7/6 (37.5p) Ground 5/6 (27.5p). There were juvenile and pensioner tickets in the ground only priced at 3/- (15p). Eintracht (4-2-4): Peter Kunter, Fahrudin Jusufi, Dieter Lindner, Peter Blusch, Lothar Schämer, Jürgen Friedrich, Wilhelm Huberts, Jürgen Grabowski, Walter Bechtold, Wolfgang Solz, Oskar Lotz. Burnley (4-2-4): Harry Thomson, Fred Smith, Dave Merrington, Brian Miller, John Angus, Arthur Bellamy, Gordon Harris, Willie Morgan, Les Latcham, Brian O’Neil, Ralph Coates. Footnote: The Burnley supporter far left on the top picture is Brian Lucas, then aged 19. Brian wasn’t given permission to take time off work from his job at Prestige to make the trip so he decided on the next best thing; he went off sick. Unfortunately for him the photograph above was published in the Burnley Express and on his return he was promptly sacked. Brian sadly passed away, aged 59, in 2007 after a long illness. He was one of my very best football friends and I still miss the cantankerous old bugger. Dedication: I’d like to dedicate this feature on our European adventures in the 1960s, which will conclude tomorrow, to those who travelled to the games in France, West Germany, Switzerland and Italy, and in particular those who are no longer with us. Like us, they’ll always be Clarets.